“The Computer Science Ontology: A Large-Scale Taxonomy of Research Areas” is a paper submitted to the International Semantic Web Conference (ISWC) 2018 , 8-12 October 2018, Monterey, California, USA, 2018. Ontologies of research areas are important tools for characterising, exploring, and analysing the research landscape. Some fields of research are comprehensively described by large-scale taxonomies, e.g., MeSH in Biology and PhySH in Physics. Conversely, current Computer Science taxonomies are coarse-grained and tend to evolve slowly. For instance, the ACM classification scheme contains only about 2K research topics and the last version dates back to 2012. 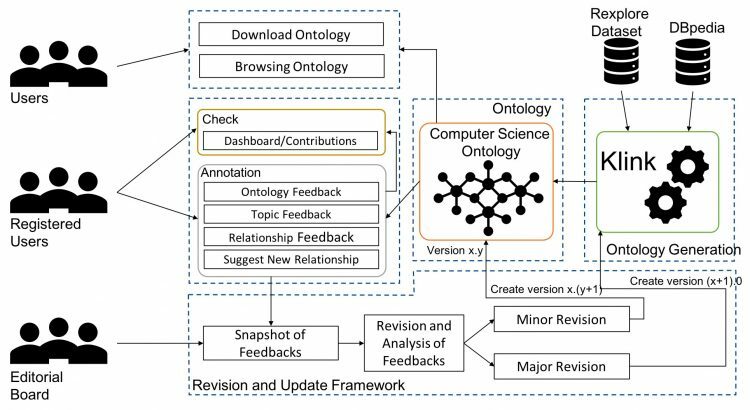 In this paper, we introduce the Computer Science Ontology (CSO), a large-scale, automatically generated ontology of research areas, which includes about 26K topics and 226K semantic relationships. It was created by applying the Klink-2 algorithm on a very large dataset of 16M scientific articles. CSO presents two main advantages over the alternatives: i) it includes a very large number of topics that do not appear in other classifications, and ii) it can be updated automatically by running Klink-2 on recent corpora of publications. CSO powers several tools adopted by the editorial team at Springer Nature and has been used to enable a variety of solutions, such as classifying research publications, detecting research communities, and predicting research trends. To facilitate the uptake of CSO we have developed the CSO Portal, a web application that enables users to download, explore, and provide granular feedback on CSO at different levels. Users can use the portal to rate topics and relationships, suggest missing relationships, and visualise sections of the ontology. The portal will support the publication of and access to regular new releases of CSO, with the aim of providing a comprehensive resource to the various communities engaged with scholarly data. The Computer Science Ontology: A Large-Scale Taxonomy of Research Areas: http://videolectures.net/iswc2018_salatino_ontology_areas/.